“Later, you will see the soldiers shoot at the fishermen”, adds Subeh, the captain of the boat. Subeh estimates that at 10 o’clock we would witness soldiers shooting at fishing boats from their navy vessels. Subeh is constantly checking the radio and horizon for signs of approaching navy vessels. As we come nearer to the area where the navy vessels patrol, packs of cigarettes and chewing gum are being consumed at a higher speed. The men chew and smoke through all of the stress and anxiety they feel. 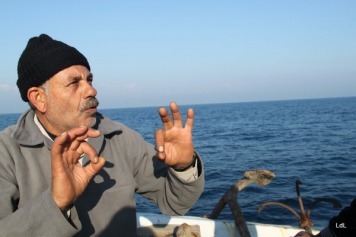 “The fear is always with us when we are at sea,” says Subeh. “Our lives are in danger at sea.”. Even within the three-mile limit, fishermen are regularly harassed, assaulted, arrested, and sometimes even killed. Since the beginning of this year, 32 fishermen were arrested and 5 were injured, while at least 20 boats were confiscated. 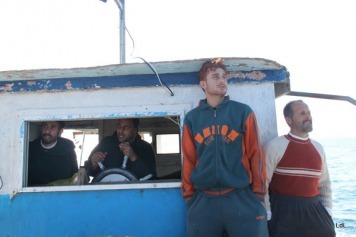 Late last December, Ahmad, Subeh, Fayez, Yassin and 2 others were arrested from the sea by the Israeli navy at night. They men were treated roughly and taken to a detention facility in Israel. The following morning they were transported to the Gaza Strip. However, their boat remained confiscated for nearly 100 days, making their financial situation even worse than it already was. While the men describe their memories of the arrest, we are around 2 nautical miles off the shore. 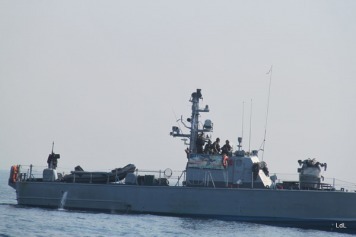 An Israeli gunboat starts to follow us from behind as we are heading south. After a while, the vessel goes away again. Soon after another navy vessel takes over; it seems we have entered another military zone. All the men keep their eyes locked on the navigation equipment and the horizon, checking where the Israeli navy vessels are and in which direction they’re moving. Subeh focuses at least as much attention on Israeli naval boats in the area as he does on the sonar which can detect fish and objects under water. When we are nearly 3 nautical miles off the coast, an Israeli gunboat in the vicinity starts firing warning shots in the air and sounds a sirene. We see how it also chases small fishing boats, with its waves almost capsizing one of the tiny vessels. Alarming and panicked messages come in through the radio from those fishermen. 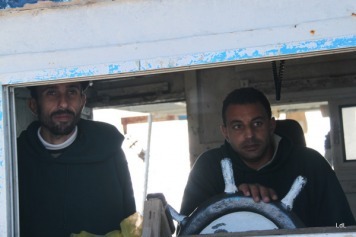 As we watch the different army vessels chase, harass, and threaten fishermen in the entire area, Ahmad and Subeh explain the different types of weaponry and soldiers each boat has on board. Apparently the one chasing us is a gunboat with snipers on board, the type of boat from which they say snipers have shot fishermen before. This job these fishermen are doing can hardly be called fishing. 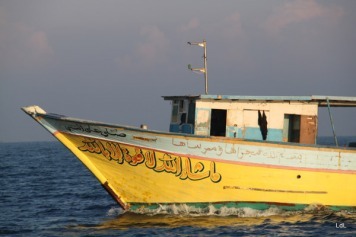 Gaza’s fishermen have become like fugitives in their own territorial waters. I genuinely wonder what, if at all, the soldiers on top of the army vessels are thinking. What do they see when they look at the fishermen? Do they see threats or military targets? In any case, the soldiers look like ridiculous clowns in their military gear on their big steel vessels, chasing the fishermen on tiny boats. Beyond human insecurity and fear, there is the crippling financial impact of the naval blockade. 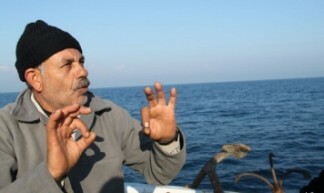 Ahmad recalls that before this limitation in 2007, he “could earn 100 to 200 NIS per day as a fisherman. 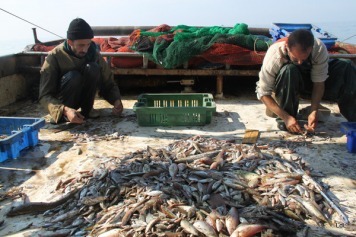 Now we can each only earn around 50 NIS in two days at sea.” According to the Fisherman’s Syndicate, around 60% of the small fishing boats and 22% of trawler boats in the Gaza Strip are not used because of the high risks involved and the limited catch. After two hours at sea the first catch gets hauled onto the boat; different types of fish, crabs, and and a lost octopus wriggle and squirm atop the deck. Ahmed, Yassin, and Fayez stare at the catch in disappointment. Knowing the answer I still ask them if this is a good catch. They all shake their head. “This is useless,” says Fayez. Him and the others kneel down to start sorting the catch. 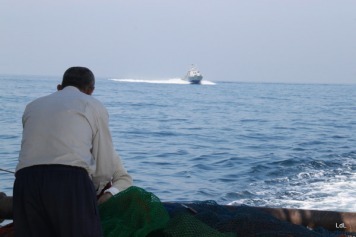 The Gaza waters are clearly overfished within the three nautical miles but no fisherman in the Gaza Strip has the option go beyond. 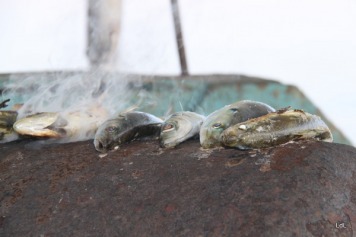 While the soldiers on the nearby army vessels are still busy doing what they believe is a military job, Yassin cheerily starts to grill some fish on top of the hot engine. After flipping the fish over a few times he generously puts several roasting hot fish on a piece of bread and squeezes out a lemon over it. “Sahteen!” he says with a big smile as he hands me the most special meal I have eaten in a while. A moment of true happiness within a situation of absurdity and infuriating madness. Even though my country, the Netherlands, has a rich heritage and culture of fishing, I have never paid real attention to it, let alone joined fishermen on their boat at 6.30 in the morning. Looking at the fishermen as they repaired the nets, rinsed the catch, sorted the fish, baked calamari on the engine, and joked over a cup of coffee, I felt mesmerized the entire day by the beauty of their profession. And the beautiful sight of dolphins jumping from the water while soldiers shoot bullets through the air. I try to imagine this happening to Dutch fishermen off the western shore of the Netherlands, but I can’t. Nothing about this situation seems logically acceptable for my brain to take in. The passive and active violence practiced by the Israeli occupation has no rational explanation. Ahmad tells how the Israeli policies towards the Gaza Strip became harsher, also at sea, when soldier Gilad Shalit was captured and says that “now they have Shalit back, so they must open the sea.” It seems that he has internalized his fate of being the target of collective punishment as logic: one Israeli soldier is captured, 1.7 million civilians in the Gaza Strip will be punished. Only it never seems to work the other way around; 1 soldier released, 1,7 million people getting their rights and dignity. For the past two decades Israel has gradually shrunk Gaza’s fishing waters through increasing access restrictions, imposed as a result of the Oslo agreement and in more recent years through the illegally and unilaterally imposed 3-nautical mile limit. 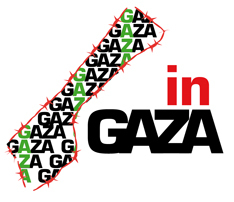 Gaza’s economy is already crippled by the severe import restrictions and ban on exports. The fishing sector –with 8,200 fishermen and workers providing for 50,000 dependents- is one of the few from which Palestinians in the Gaza Strip would be able to make a living, if it wasn’t for the 3 nautical miles limit. By 2010 the fishing catch had decreased by 37% compared to 2008 and this amounted to only half of the 1999 fishing catch. 100 NIS is the equivalent of approximately $26. Zo wordt weggelaten hoe Israel de Palestijnse vissers helpt met een betere, modernere en veiligere beroepsuitoefening, door het opzetten van visboerderijen. “The project first emerged in 2010 due to conflict between the IDF [Israel Defense Forces] Navy and fishermen breaking the maritime closure”. 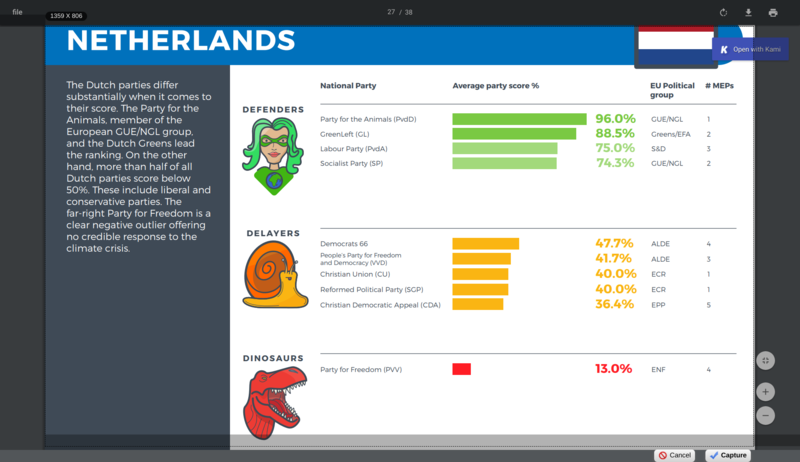 Het bericht is eenzijdig. Jouw reactie ook, want je link bewijst, dat de visboerdrijen op worden gezet vanwege de in het bericht genoemde redenen. En de vraag is natuurlijk, of deze visboerderijen de eerstvolgende incursie zullen overleven. PS: ik ben ook een goede probleemoplosser van door mij gecreëerde problemen. 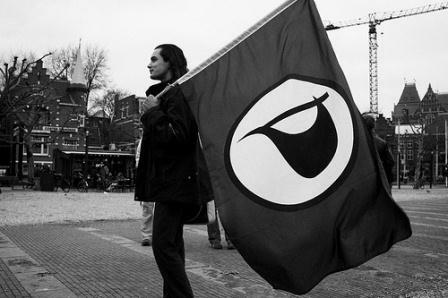 De nazis hadden modelkampen waar het rode kruis toegang toe had. Alles goed, ze hadden toch gratis eten en dekens tegen de kou. 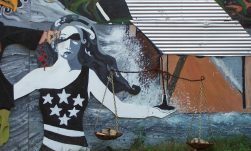 De I”D”F heeft natuurlijk helemaal niets te zoeken in de wateren van Gaza. Sterker nog, ze zouden de territoriale wateren (twaalf zeemijl uit de kust) daarvan niet eens in mogen varen zonder toestemming van Gaza. In Dachau was de Arbeitseinsatz ook de belangrijkste instantie. Arbeit macht frei.. 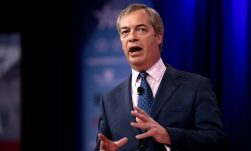 In dit soort gevallen is het altijd interessant wat Clausewitz te vertellen had over internationaal recht als er zeer grote machtsverschillen bestaan tussen de conflicterende partijen. 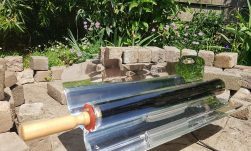 Daarnaast, kunnen we de WO2 voor één keertje met rust laten?